PowerPoint Password Recovery is a program to recover lost or forgotten passwords for PowerPoint presentations (*.ppt, *.pptx) created in Microsoft PowerPoint 2016, 2013, 2010, 2007, 2003, XP, 2000 and 97. Easily recover MS PowerPoint password using combination of Brute-force attack, Mask attack or Dictionary attack. Simply select your PowerPoint presentations (*.ppt, *.pptx) and wait for a few minutes while your password is recovered. 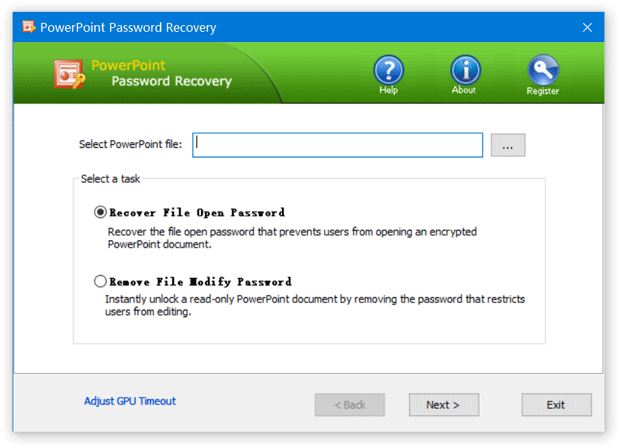 Recover lost or forgotten passwords to PowerPoint files (*.ppt, *.pptx). Support Microsoft Office PowerPoint 2016 / 2013 / 2010 / 2007 / 2003 / XP / 2000 / 97. 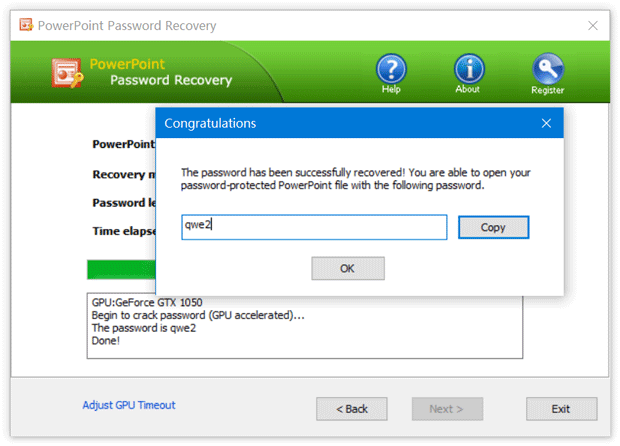 Screenshot 2: Recover lost or forgotten passwords for Microsoft PowerPoint (*.ppt, *.pptx). You forget your ppt file password now you want open it. You have an old PowerPoint presentation with password protected, but lost the password in a C drive crash. You've have a PowerPoint file protected with a password by former co-worker, who is no longer in your organization. You had created a PowerPoint in Microsoft Office, but now you forgot the password. The file is very important for you. "I needed to open an important PowerPoint file made by someone who is retired for a while now. But it was protected with a password. Your tool helped me to find this password. Many thanks again for this tool, you saved me a lot of time!" "Thank you. You have made a happy customer and a good reference. The program was very simple to use." "I appreciate all your help and will definitely recommend to anyone that needs passwords recovered or cracked." Learn How can you recover forgotten PowerPoint password easily with PowerPoint Password Recovery program.